Though I have many crafting interests, I have a passion for glass! 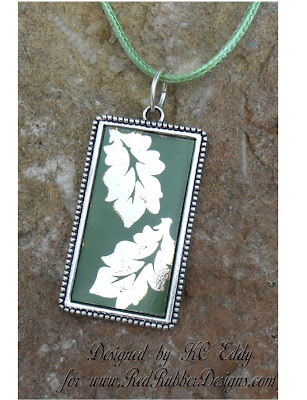 I make a lot of fused glass jewelry, and have been etching on dichroic glass for a long time. Recently, I discovered that I could use rubber stamps to provide the pattern on the glass and use them in etching. The possibilities are ENDLESS!!! 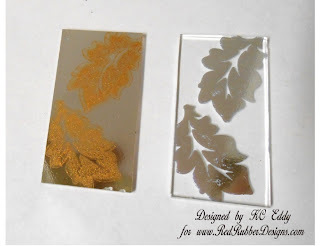 So today I'm going to show how to use your stamps to etch dichroic glass. 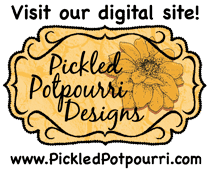 First a little about Dichroic glass....Here's the Wikipedia definition: Dichroic glass is glass containing multiple micro-layers of metals or oxides which give the glass dichroic optical properties. The main characteristic of dichroic glass is that it has a particular transmitted color and a completely different reflected color, as certain wavelengths of light either pass through or are reflected. This causes an array of color to be displayed. The colors shift depending on the angle of view. In short - it is glass (usually black or clear) that has a thin, shiny coating on one side. If the glass is used in a fired (fused) project, that coating becomes permanent, but prior to firing it can be removed through various methods. This means it needs to be protected to not accidentally scratch the coating, but it also means that you can etch designs into the coating to add really cool effects to your pieces. 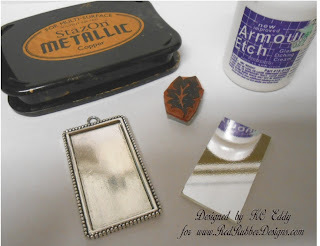 You can etch it by scratching a design, or with a powered Dremel tool, but I think the easiest way to etch is to use Armour Etch Etching Cream. For this project, you will need: -A piece of thin, clear dichroic glass. (I'm using silver as my Dichroic color) You can find dichroic glass online or at many art supply stores that carry stained glass supplies. -Rubber Stamp - I'm using a leaf from the Red Rubber Designs "Place in My Heart" stamp set. 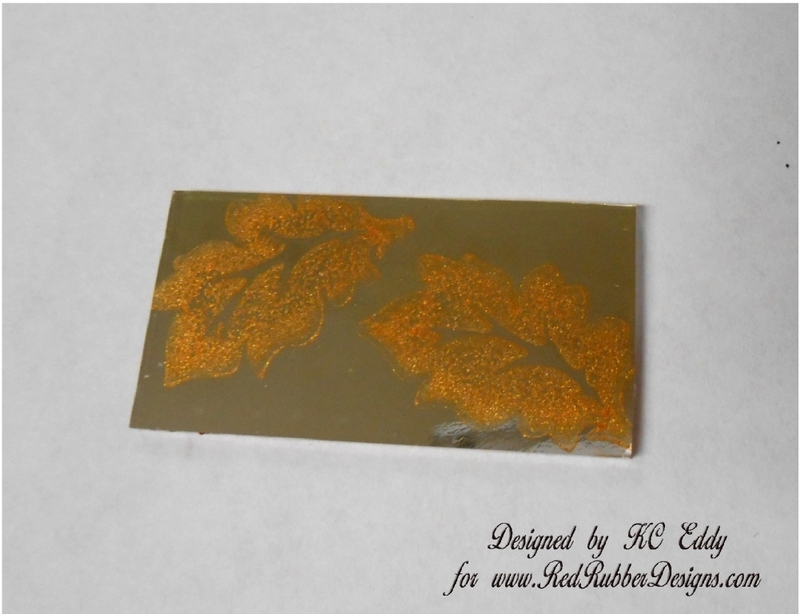 I really like leaf motifs and this stamp is solid enough to show up well in the dichroic glass, but also has nice detail in the veining. 1. This first step, for some, will be the toughest....You'll need to cut your glass to fit inside the pendant blank. If you are a glass crafter, this is not a problem, but if you are not used to cutting glass, this may present a challenge. 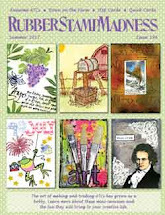 Since this post is about stamping, not about cutting glass, I'm not going to go into how to cut glass. If you are not familiar with it and don't have the tools, you have options. 1 - find a glass shop in your area and have them cut if for you - even hardware stores that do window repair have what it takes to cut the glass. or 2 - if you order the glass from someone online, ask them to cut a piece the size you need. 2. Rub your glass down with rubbing alcohol to remove any residue. Place the glass, dichroic coating side up, on the table. Ink your stamp with Stazon Metallic Ink, and stamp a leaf on the glass. The really nice thing about stamping on glass is that it can be removed easily if you botch it the first time. If you're happy with the clarity of that stamp, re-ink the stamp and do another one, and another one, until you are happy with the results (I only did two for this piece). It may take a couple of trials to figure out how much ink works best. If you make a mess of it - clean it with rubbing alcohol and start over. 3. Let the ink dry completely - 5 - 10 minutes. Put on the rubber gloves to protect your fingers (this stuff will eat glass - it's not good for your skin) Holding the glass carefully by the edges, brush a thick layer of Armour etch over the front (dichroic) side of the glass. You won't want to use one of your best paint brush for this...use an older brush or buy a cheap one. Be sure to come all the way out to the edges of the glass. Some dichroic coatings etch faster than others - some will etch in 30 seconds or less - some will take 5 minutes or more. For this reason, I usually hold onto the glass so I can check it frequently. By looking at the back side of the glass, you can watch your design appear. 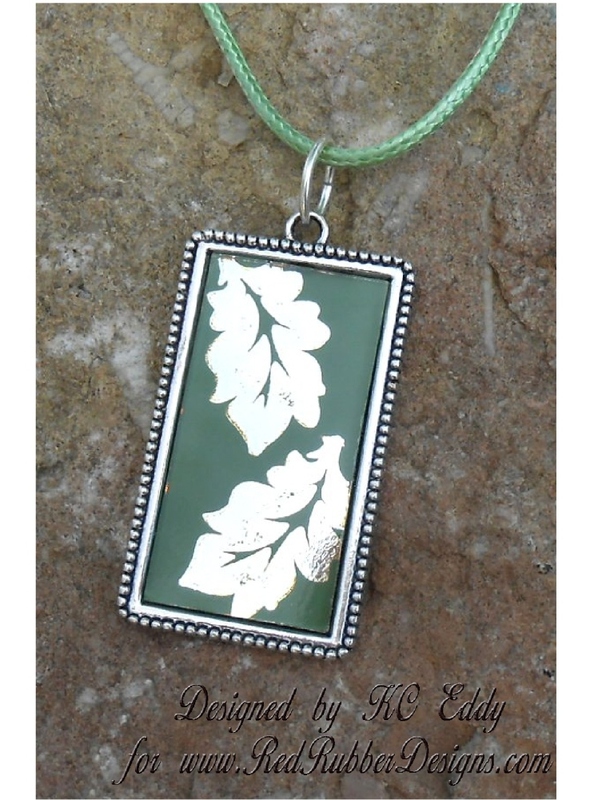 The stamped leaves will retain their shine and the background will begin to turn white. Once the background is completely white, with no shimmer, rinse the Armour Etch with clear running water. (rinse your paintbrush out too) The Ink will probably rinse off too, but if it doesn't you can remove it with rubbing alcohol. You're almost done! 4. Paint black or a dark color acrylic paint on the FRONT side of the glass - over the leaves. Remember I said that the dichroic coating can be accidentally scratched? We are going to mount the glass upside down in the pendant setting so that the clear glass is towards the front and the dichroic coating will be protected. 5. After the paint has completely dried (it may take two coats to get nice even coverage), glue the glass piece, paint side down into the pendant setting. Add a jump ring and chain or cord and you have a beautiful necklace! You can find this tutorial in the Red Rubber Designs store where you can download it for FREE! Wow what a stunning neckpiece , its fabulous and so beautifully made well done Hugs Elaine. Wow, KC! I have to try this! Great tutorial! KC you are incredible! This is really lovely. What a talent. I think you could make out like a bandit selling these pieces. I love the idea, even if I never do it! Great project! I LOVE your blog. Your work is stunning! Beautiful project, KC! I love the finished product! This is soooooo cool! Can't wait to try it. You are an amazing artist, KC. This is an absolutely amazing project. Love your final piece. You've really raised the bar for us for tutorials ! I love this project too - amazing KC. The necklace is beautiful!